Martha Stewart has long been a supporter of creative entrepreneurs and small businesses across America. 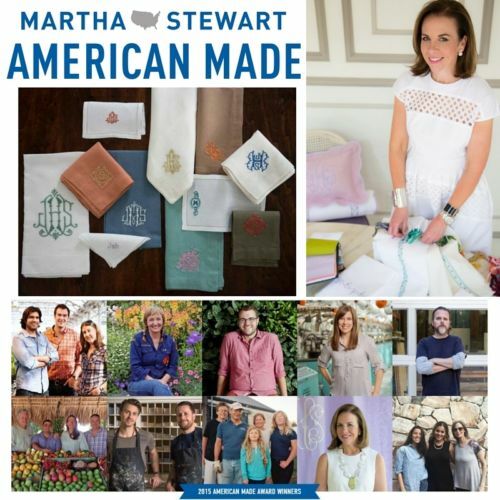 This weekend, in New York City, Martha will celebrate this year’s American Made Award winners and we are thrilled to share that Leontine Linens is one of 11 honorees. Jane Scott Hodges founded Leontine almost 20 years ago and we are proud to be American made since the beginning. American Made spotlights the maker, supports the local, and celebrates the handmade. The program is made up of people and communities that have turned their passion for quality craftsmanship and well-designed goods into a way of life. For more than 20 years, Martha Stewart has celebrated this spirit of innovation in the pages of her magazines and on her television shows. Now, through American Made, Martha Stewart and the editors of Martha Stewart Living are spotlighting the next generation of great American makers: entrepreneurs, artisans, and small-business owners who are creating beautiful, inspiring, useful products; pioneering new industries; improving local communities; and changing the way we eat, shop, work, and live.